In eighth grade, Mary McNeil had an important choice to make. She was preparing for her freshman year at Canton High and thinking about what fall sport she would choose to play. McNeil was a soccer player and had been throughout her youth, but that was the same season as field hockey. McNeil had not played field hockey growing up, in fact she did not start the sport competitively until she got into high school, but after watching four sisters go through the Canton field hockey program, including her sister Michelle who was going to be a senior that fall, could she really end the family’s legacy in the sport? As it turns out, no she could not. And she has no regrets for that decision to hang up the soccer cleats and pick up a field hockey stick. “I kind of decided last minute [to switch] because my sisters were like, ‘You’re really going to decide to play soccer?’ But I love it and it was the best decision,” McNeil said in a phone conversation this week. 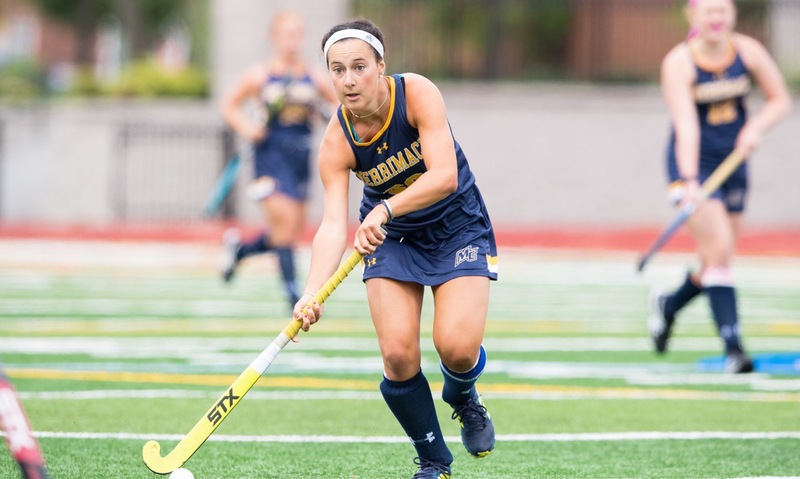 Eight years after making the decision to join the family tradition, which started with her mother Kathleen, who played field hockey at UMass Dartmouth, McNeil is now a standout at Merrimack College. The senior midfielder is a three-time all-conference selection, an All-American, and one of the top 10 scorers in Merrimack history. She also has the Warriors ranked No. 6 in the nation, according to the latest National Field Hockey Coaches Association (NFHCA) Div. II poll. Michelle went on to play Div. I field hockey at Holy Cross. Their older sisters Lisa and Patty both played in the Northeast-10 at Stonehill College, while Lauren also played at Merrimack. A sixth sister, Andrea, is now a freshman on the St. Anselm team. After three all-star seasons at Canton, which included a league title and a Div. 1 South title as a freshman, McNeil joined the Merrimack program, continuing another family legacy. She credited the time she spent watching her sister Lauren play (and attending Lauren’s husband’s football games) at Merrimack for helping make the decision to go to the North Andover campus easier. McNeil made an instant impact for the Warriors, starting 21-of-22 games and leading the team in goals (14), assists (11), and points (38). She was second in the NE-10 in goals and was named to first team all-conference and an NFHCA Second Team All-American. With McNeil leading the way as just a freshman, Merrimack went 16-6 and reached the national championship game where they lost by a goal to East Stroudsburg (Pa.). Over the last two seasons, the Warriors have failed to hit the same heights. The Warriors went 9-8 in 2016, despite McNeil again being named first team All-NE-10 for scoring seven goals and recording a team-high seven assists. Last fall, Merrimack went 11-7, but McNeil’s numbers dropped to just three goals and a team high-10 assists. She was named second team all-conference. The Warriors are 3-1 to start the new season with the only loss coming to East Stroudsburg by a goal. McNeil is firing in the goals again with five on the season to go along with four assists. She credits a renewed team chemistry, and a large recruiting class, for helping get Merrimack on track in the early going. In addition to the family legacy at Merrimack, there is starting to be a Canton legacy as well. Junior forward Lindsey Nolte, who also played ice hockey and lacrosse with McNeil in high school, and freshman goalie Riley Brown are on the roster. Former Milford standout Jessica Palmer is also part of Merrimack’s Hock contingent. As the season progresses, McNeil continues to move up the program’s all-time rankings. She is currently eighth all-time in points and second all-time in assists. She shrugged off talk about what it would mean to set a new record, instead focusing on her desire to win titles this season. “It’s awesome,” she said, “but at the same time I want to win. So, just doing anything I can to end our season getting to the goals we want to accomplish. On Nov. 6, in the penultimate game of the regular season, the Warriors will host St. Anselm. It will be the final home game for McNeil, her senior night, and it will also be a family reunion, as it will be the opportunity to face her younger sister Andrea for the first time. Merrimack will get back on the field against Franklin Pierce on Tuesday and the quest for a conference title will begin with NE-10 play next weekend.